After flying to Athens we'll transfer you to your hotel. Get your holiday started right away with an evening walking tour of Plaka, the city's Old Town, which sits at the foot of the Acropolis. Its two main streets are lined with cafés, shops and interesting old buildings. There are also plenty of restaurants, and we've selected a great one for tonight's welcome dinner. There's so much to discover in Athens, and today's tour packs plenty in. First, you'll see the Panathenaic Stadium, which has hosted sporting events for centuries, including the first modern-day Olympics in 1896. You’ll pass the Parliament building, and right in front of it, the Tomb of the Unknown Soldier, guarded by members of the presidential guard in traditional dress. You’ll see Hadrian's Arch, said to have been built to celebrate the arrival of Hadrian to the city, before arrival at the iconic Acropolis. This hilltop citadel is home to several ancient ruins, including the Parthenon, which you’ll have time to admire. Its imposing columns are unmistakable and although it has suffered much damage over the years, the basic structure remains intact. You’ll also have the chance to view the fascinating exhibits in the Acropolis Museum. Set your own pace with free time in the city this afternoon, or perhaps join an optional excursion to the Temple of Poseidon at Cape Sounion. You've a full day left in Athens, so there's time to see more of this incredible city if you wish. If you'd rather spend your time cruising the Greek islands that lie just off the mainland, join our optional excursion. Lunch and traditional entertainment are also included, so relax and enjoy! You can brush up on your Greek mythology on today's excursion to the Peloponnese region. This is the legendary stomping ground of the gods and from where the Argonauts set off in search of the Golden Fleece. Even your journey here is exciting as you cross the narrow, steep-sided Corinth Canal. Visit the Theatre of Epidaurus, a fine example of classical architecture, which was not modernised during the Roman era. Its approximately 14,000 seats have hosted numerous and varied events and the acoustics are impressive even by today's standards. You'll then head to the first capital of modern Greece, Nafplion, founded according to mythology by the son of Poseidon, Nafplios. There's time here to stretch your legs and enjoy lunch if you wish before we set our sights on the Palace complex of Mycenae. We'll discover its highlights with your Tour Lecturer and end our day at the Treasury of Atreus, an impressive royal tomb. Our overnight hotel is in Nafpaktos, and we'll head there now. The pretty port city of Nafpaktos is a delight to explore on foot. As you do this with your Tour Lecturer this morning you'll see that all roads lead to the sea. After this you can rest your legs as we head up to the Castle of Nafpaktos by coach. It's wonderfully preserved, and from its hilltop position you'll get fantastic views. 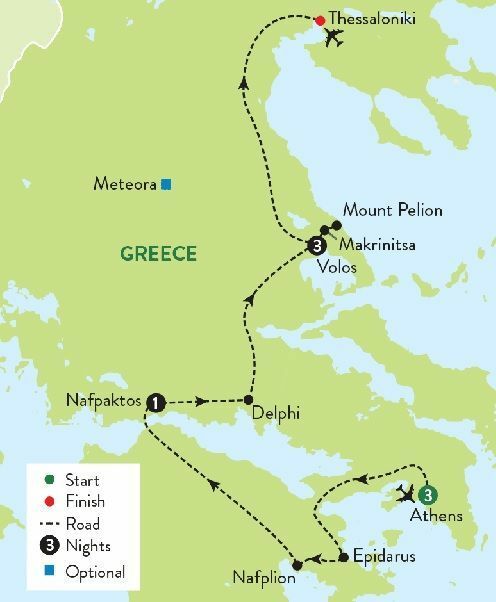 We'll take to the road once again, and this time our sights are set on one of the most sacred sites in Greece, Delphi. Said to be the place where heaven and earth meet, this was an important religious sanctuary. Your sightseeing includes the Sanctuary of Apollo, where pilgrims would come to leave offerings to the gods, and the Treasury of Athenians, where the offerings were stored. You'll be able to learn more about this fascinating site at the Delphi Museum. Our final journey of the day takes us to our hotel in Volos. You can spend the day just as you wish, whether that's relaxing at your hotel, exploring Volos at your own pace, or joining an optional excursion. This time you'll visit the famous Meteora Monasteries, perched atop towering pillars of rock. It seems inconceivable that anyone could even climb up here, let alone build 24 monasteries. But back in the 11th century, in seemingly impossible conditions, that's exactly what happened. Just six remain today and you'll visit two if you join today's trip. You're going to take a memorable journey through stunning scenery today on our optional excursion aboard the legendary Pelion steam train. It will take you to some of the picturesque villages around Mount Pelion, as you sit back, relax and take in lovely views of the Aegean Sea. We'll disembark first at the beautiful village of Milies, where we can stretch our legs, then it's on to Portaria, located at the foot of a mountain. Our final stop will be at Makrinitsa, which is popular with artists and has a number of art galleries for you to peruse. This evening you're invited to a Greek evening back at Volos, with traditional dishes on the menu alongside the anise-flavoured aperitifs tsipouro and ouzo. Today you’ll transfer to the airport for your flight back to the UK. Discover ancient Greece on this eight day tour with Travelsphere. Packed with fascinating sights and experiences, you’ll learn about the myths surrounding this stunning part of the world, admire its beautiful scenery and sample some of its delicious food. Located at Panepistimiou Avenue, near Syntagma square, right in the heart of the Historical and Commercial Centre of Athens, the recently renovated TITANIA Hotel creates its own "page" in the history of Hospitality. The impressive "La Brasserie" restaurant, as well as the Hotel''s Awarded Gourmet Roof Garden Restaurant "Olive Garden", constitute Titania a unique Athens Hotel which guarantees its guests an unforgettable stay. All rooms have sound-isolation and offer an up-to-date integrated communication and entertainment system with high-speed Internet access and a wide variety of digital movies and music, instant PC connection, fax modems and Satellite TV. Each room has its own private safe deposit box with a personal security password, a fully-stocked mini bar, and an independent cool/heating system. Just a short walk from the harbour and beach your will stay at the 3-star Hotel Nafpaktos. Hotel facilities include a restaurant and bar. Bedrooms feature en suite facilities, TV hair-dryer and air-conditioning. Volos Palace was built in 2004 and faces the Pagasetic Gulf, inspired by classic and contemporary comforts. Volos Palace is set in the centre of Volos, opposite the Municpal Theatre and close to Town Hall. The hotel is next to the beach, close to many tavernas with local music and coffee shops. The hotel is designed to offer high quality services and facilities to guests. There is an onsite restaurant and coffee shop. All bedrooms are spacious and elegant, equipped with; balcony, internet access, air conditioning, hairdryer and private facilities.